Artichokes are visually interesting, and fun to cook and eat. They’re in season during the winter and spring months, however can often be found year around. Canned artichoke hearts can be found in most grocery stores — however, be sure they are jarred in olive oil or another healthy oil. These budding beauties can be grilled, boiled, steamed, or even cooked in a pressure cooker. After cooking, the pedals and heart are edible and ready to be dipped in mayo or a Paleo-friendly sauce. The top of the pedals are protected by thorns, but the thorns become soft after cooking. Artichokes are quite high in fiber, Vitamin C, Vitamin K and folate. 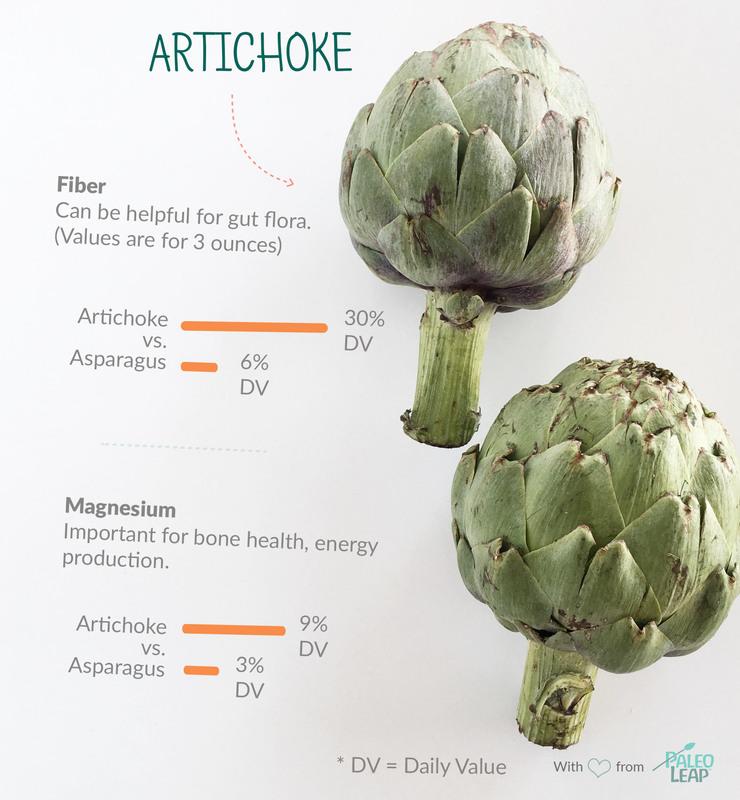 Whether served stuffed, or as a side dish to a main protein dish, artichokes can be quite filling and nutritious. Orange dots show how 1 artichoke fits into the typical nutrient profile of a Paleo meal. SELECT: Choose a firm artichoke with a vibrant green color. Be sure the leaves are compact and not brown. SEASON: Artichokes are in season during the winter and spring months. However, canned artichokes hearts are readily available year around. PETALS & HEART: The base of the petals and the artichoke heart are both edible. Rinse and trim artichokes and place in a pot of boiling water and allow to simmer for 30-40 minutes. Dip in melted butter or mayonnaise. Place artichokes on top of a steamer basket, cover and bring pot of water to a boil. Steam for 30-45 minutes. Add canned artichoke hearts to a mayo-based tuna salad. Combine artichokes, spinach and onion with a creamy base (mayonnaise, coconut milk, or even ground cashews) to create a delicious dip.